[LilyPad] Possible suggestion for slightly annoying issue. So yeah, I was gonna play on PCSX2 today, but I noticed my controller was not working. 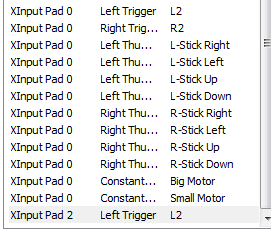 I checked LilyPad and the bindings were all there still, but it turns out that all the bindings were set to XInput Pad 0, and if I tried to add a button now, it would be assigned to XInput Pad 2 instead. This means I have to redo the entire binding and make sure it's set to the correct XInput Pad slot number. My controller has always been the first one to connect normally, so why it was given device ID #2 now is beyond me, but either way - my suggestion is simple (or maybe it's not simple at all); Is there a way to 'swap' the slots assigned to the buttons instantly? So let's say you have an extra dropdown box somewhere on the button section, allowing you to instantly 'detect' or 'change' what slot (pad number) is currently being used for the controller? [Edit] Maybe this is better placed in the Plugin section. @jes, can you move this topic there?